Phytohaemagglutinin (PHA), Concanavalin A (Con A), interleukin-2 (IL-2), and monoclonal antibodies to CD3 (CD3MoAbs) are used for the assessment of the T-cell receptor (TCR) BV gene family expression in autoimmune disorders and multiple sclerosis, and to produce clones for assessment of cytokine profiles in progressive human immunodeficiency virus infection. The authors examined the effects of these stimulants on the TCR V beta repertoire of resting and blastic CD4+ and CD8+ normal human peripheral blood lymphocytes, using three-colour cytofluorometry and a panel of anti-TCR V beta monoclonal antibodies. IL-2 was associated with an increased percentage of blastic CD4+ cells expressing V beta 5.1 (from median of 3.7% to 8.0%, P = 0.0002) and blastic CD8+ cells expressing V beta 5.3 (1.0 to 1.5%, P = 0.0039). CD3MoAb caused a slight increase in V beta 6.7 + blastic CD4+ cells (4.5 to 6.9%, P = 0.0078). PHA did not alter the V beta repertoire of blastic cells. Con A caused skewing in CD8+ blastic cells, toward expression of V beta 5.2/5.3 (3.1 to 8.1%) and V beta 5.3 (0.8 to 4.8%) (P = 0.0020). Thus, IL-2 stimulation causes slight alterations in the V beta repertoire that should be taken into account in certain research settings. 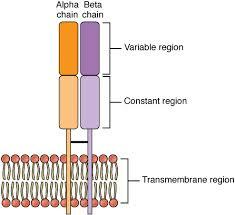 Con A produced skewing in CD8+ blastic cells suggesting that, in the presence of CD8, either Con A binds selectively to certain V beta or the three-dimensional complex created by Con A’s binding to other T-cell surface molecules induces preferential V beta 5 stimulation.